Today, you are a member of... Your Psychic Butler - You Are A Member! We all need a psychic butler every once in a while members. Someone to clean-sweep the detritus acrrued from the human condition and to order our noetic sock drawer. Said uber underlord would be mythical enough so as we never get sassy with them, yet badass enough to keep our attention. Someone to take a sonic boom at any and all irksome irrationalities by anchoring the action with a solid rhythm. 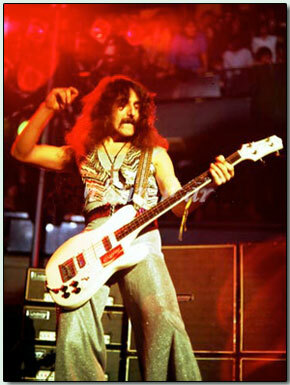 And this week you are in luck, members, as it is a week that celebrates the 62nd birthday of the most bitchen bass player of them all: Geezer Butler. Whether laying down the proto-metal of Black Sabbath or fighting the good fight as a Vegan, Mr. Butler is the ideal head honcho. And don’t be fooled by the bass-player-in-the-background noise. Sure, Ozzy chews up the scenery and it’s hard to avoid Tony Iommi’s Anton-LeVay-stare-into-you-soul riffs, but if you want the real majordomo for your mind’s eye, saddle up next to drummer Bill Ward and watch Geezer clean it all up.